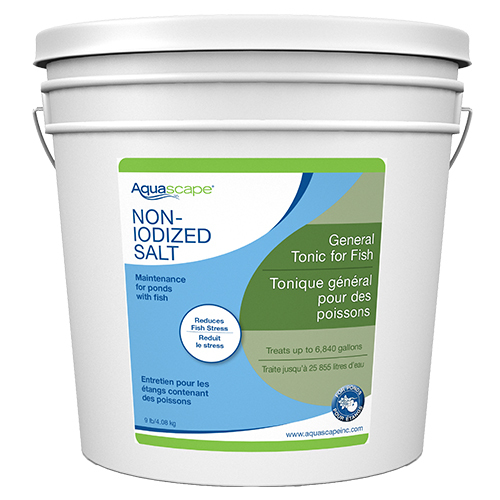 Aquascape Non-Iodized Salt is a general fish tonic that helps treat fish health problems such as parasites. It uses non-iodized salt so it's safe for your fish and aquatic plants. The non-iodized salt will also help reduce fish stress by repairing your fish's natural slime coat and restore electrolytes for proper gill function! General tonic for pond fish - Treats fish health problems. Regenerates mucus membrane - Also known as slime coat. Non-iodized salt - Safe for your pond fish. Restores electrolytes - Allows proper gill function.